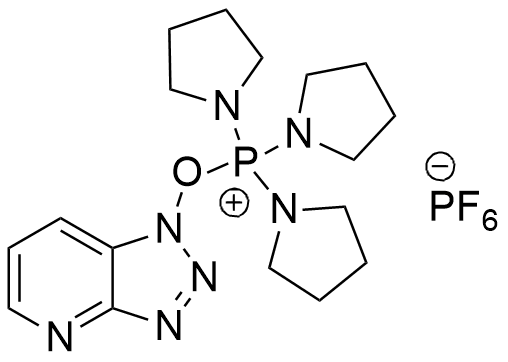 PyAOP is a phosphonium salt derived from HOAt, is generally more efficient than BOP and PyBOP as coupling reagent. This pyrrolidino derivative PyAOP does not release the toxic HMPA in the activation step. PyAOP, as other phosphonium salts, cannot react with free amine function and therefore does not terminate the peptide growing as the aminium salts do, through the formation of guanidine derivatives. It is special advantageous for cyclization reactions. F. Albericio, M. Cases, J. Alsina, S. A. Triolo, L. A. Carpino, and S. A. Kates. Tetrahedron Lett., 1997, 38, 4853-4856. L. A. Carpino, A. El-Faham, C. A. Minorb, and F. Albericio J. Chem. Soc., Chem. Commun., 1994, 201-203.